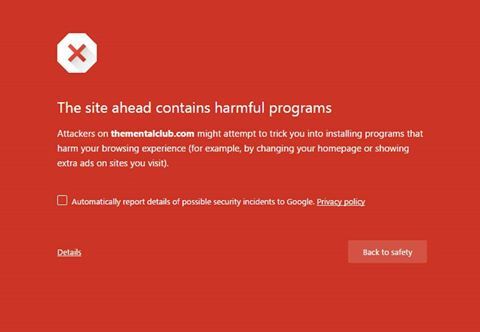 How to get rid of warning "the site ahead contains harmful programs"? If my site is getting this error in Google Chrome “Site ahead contains harmful programs”, how can I remove it? This error is shown in chrome because your site has been inserted with some scripts of code which can trick visitors into installing programs that can harm their computers or browsing experience. 1. Go to Google Webmasters and Add your site. 2. You have to verify your site in order to add to Google Webmaster, easiest way to do that is by HTML upload verification in root directory of your site. 3. Once you have verified your site, you will be on Dashboard of webmaster account for website. 4. Most of the time you will notification of error in site or security issue but if you can’t see one, go to Security Issues in the left sidebar. This will show the problem with specific files of your site which are forcing Google Chrome to show that error. Just get rid of those files or do a clean upload of same file (if they really belong to site software). Once you have done this, go to security issues and mark them as fixed and your site the error will go if all errors are fixed. If you need more help, reply back with error.